There is no much I can honestly say about him, God race was out of the spotlight for half of the year because of the chained collaborations during version 15. Hindu Gods gameplay is way too different from the 8xian, but you can mix them if you want for very cool combos. Fire Gods alone doesn't offer really much, they are mostly cards that exist to be played with other attributes and races, but I think they will get their own identity after a while. 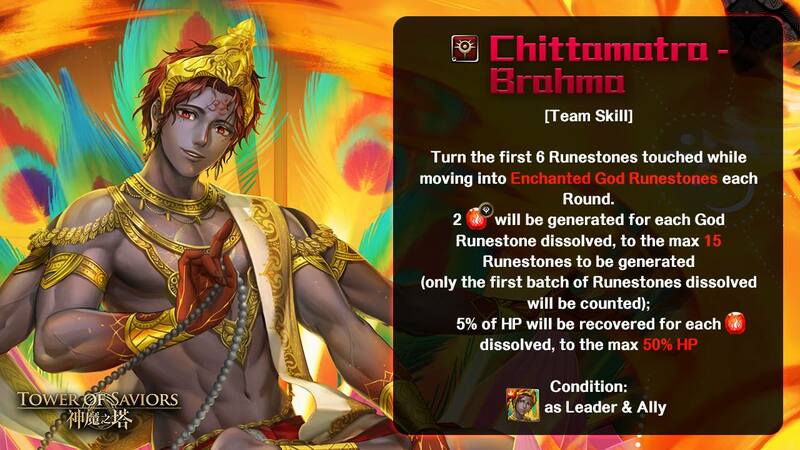 Brahma can also be played as a "rainbow" leader with some very strong Gods that provide more utility. One thing that is worth to mention is that despite he is a modern Jackpot he doesn't provide built-in bulky stats or damage reduction, but this is because he provides way too much damage and team building flexibility. If you are really concerned about that kind of stuff you should consider adding Vishnu, Auriga or some other shield. As you can see enchanted God path is available and it would be good to always start your path with the runestones that are the most in number. - Try to avoid dissolving fire runestones in the first batch, those will be generated anyway if you dissolve the god runestones you created via the team skill, those undissolved runestones can chain with those from skydrop as well. - If you are desperate for healing, then start dissolving the fire runestones and all god runestones present in your board, this should generate more fire runestones in the skydrop and healing in that way. - If you are playing a multi-attribute team, start with the runestones of the members that are the most or the attribute of the card that is supposed to deal the most damage. - When facing stuff like "dissolve 15 water runestones", be sure to NOT dissolve water runestones in the first batch and dissolve all other types of runestones. The priority of the system is the runestones that are not dissolved and then the one that has the least amount in the board. This is a super strong active skill, literally 4 active skills in a single one, the cooldown is rather low but depending on your team it is quite likely that you will be saving it for burst. To be honest this part is hard to define, some players will say that mono fire is the way to go because the fire god drop is the best, and others will tell you that the best thing is to slot full utility or full damage based on how skilled you are, this being said I will better jump to the team building options and sample teams. Let me start with the relevant Fire Gods that tend to be used as members and then I will mention utility and members from another attribute. (Note: starting from this thread I will be adding the links to the card images instead of text). Spear of Tenacity - Uriel: The fire attack buff is fair along with the cooldown, there are very specific scenarios where high armor can be problematic and won't allow you to burst properly, mainly those of enemies with puzzle shield. The conversion is not that necessary but could be helpful in an emergency. Rage of the Roar - Skeggjald: As you can see, Brahma doesn't provide damage reduction in any form, so members that can lower the damage received or the enemy attack can be really important for your strategy. Her amelioration skills are delightful for the control she offers, but be wary that if the enemy is uncontrollable you won't be able to use her at all. Also, you can't stack her active with Auriga because she breaks the damage reduction effect. Incurable Madness - Heimdallr: Brahma doesn't have access to Shakuro so he can't heal like Hephaestus, but Heimdallr still prevails as a tactic to deal with enemies that lock heart runestones. You also can heal with the Enchanted Fire God runestones and those transferred drops can chain really well with the skydrop. Rhythm of Blazing Flames - Yan: She provides one of the best team boosts in the entire game with no drawbacks and also can provide heart runestones for emergency healing, sadly she is a luxury not everyone is lucky to have. Var the Embodiment of Vows: Her stage is available permanently in the lost relic pass and is one of the cards I recommend the most to farm even if her stage is quite hard. Being able to provide 2.5x to gods of any attribute every 6 turns is good enough if you just need an additional boost. Dipankara the Eternal Buddha: If you are going for fire mono, then your DPS choices might be limited, Dipankara enchanted heart conversion is solid enough and I think that the extra attacks are good to have. If you are going for a multi-attribute team just stick with Jiang Ziya or Pollux. Sunlight of Hyuga - Amaterasu: Very situational but I can understand if you are going for this one, because turning the entire board to God Runestones is really helpful and the reflected damage can save you in many scenarios, especially because this skill is not part of the control category. Carriage of Hope - Auriga: This card is often overlooked because it is in the same line as Oichi and it would be much better if it worked like Shyplant instead. Anyway, Auriga can be saved up to 100% so the damage received will be lowered until 1 damage is received (mechanics make it like this). High Spirited - Cao Guojiu: There are very few cards in the game with active skills that can delay the enemy and this is one of them, not much needed if you own a craft like "Khaos Craft" but still. He is really good when you use his active in conjuction with Zhongli Quan. Emulative Ascetic - Zhongli Quan: Arguably the worst card in the entire 8xian, that is just because he is way too situational, there will be very few scenarios where you will want to get rid of water runestones in the first batch, and the boost is specific against fire enemies so you will need Cao Guojiu if the enemy is from another attribute. Rage of Aversion - Agni: in my opinion of the strongest God cards in the entire game, I highly recommend him if you struggle to dissolve 5 types of runestones every round or if you are facing enemies with obstacles like a high number of weathered runestones, combo trojan, or X burning. If you use his active in conjunction with Brahma you will get more than enough freedom to solve the board. Dark Perception - Lakshmi: The damage that she offers is really high and have almost full uptime thanks to the team skill of Hindu common cards. The only tricky part with her is that despite the effect is in play it will need a trigger by dissolving light, dark and heart. She is mainly designed for Vishnu, but still considerable for Brahma. Obsessive Desire - Varuni: She is more reliable than Lakshmi but have a lower multiplier that also boosts recovery, you can either use both together or pick one of the 2. Divine Pureness - Parvati: Your leaders will hit like a truck and you can use her along with the other 3 Hindu commons mentioned in this thread for pure steam rolling since the very first turn. Eye of Compassion - Sariel: His main usage is to remove debuffs and he is pretty common for that, I will highly recommend obtaining this card. A lot of Brahma "flexibility" is related to the fact that he can use Sariel and Aqua as members. Sariel conversion is very situational just like Uriel. Idiotic Goddess - Aqua: You hardly can go wrong in here, but depending on your team you might want to be careful when using Sacred Break Spell for damage. God Blow brings a Mini-Ghroth to this team and you will get your board converted after effect to include all 5 types. Easy chain with Brahma team skill so, yes this is a really strong combo. Gemini of Recall - Castor & Pollux: Arguably one of the most powerful cards in the game and significantly popular in every setup that allows you to play either dark or god members. He will be the main damage dealer for your team and source of damage via Luna active skill. He will take a while to max but it is totally worth it. Libra of Justice - Luna: She is one of those cards that can change the way on how people look at your inventory, the effects provided by her awakening recall affect the entire team and she will be the one in charge of taking down bosses by sharing Pollux damage to the rest of the team members. Some people say that Luna is a bit rare to get, but MadHead usually boost her draw rate and bring featured events to get her quite often. There is no way to max her skill without harpy so that might hurt a bit the process to fully train her. Outside of God setups she does the same role for traditional light teams that rely on Lucifer as main damage dealer. Qi Tian Di: Before Pollux Awakening Recall was introduced he used to be the damage dealer for dark and god setups, then he has stayed relevant in the meta because he is able to explode runestones of selected attribute and have stats comparable to those of sealed lords (4.6k HP wtf?!). Sadly this guy was not returning and was the hardest boss in Tower of Saviors history at the time so a very small amount of players have access to him. Supreme Lotus - He Xian'gu: She is able to provide a substantial amount of constant damage thanks to her continuous effect, the additional 6 runestones generated are also appreciated but those come by dissolving light and dark in the first batch which rarely will happen in Vishnu. Her effect lasts until you receive damage but the cooldown is so short that it doesn't matter that much. Anubis the Jackal of Life & Death: a bit comparable with He Xian'Gu his buff is not that volatile and you get cooldown reduction upon deactivation so it is possible to have both of his boost in play during 1 turn. The increased dark runestones drop rate can chain pretty well with those generated by the team skill and the boost will affect everyone if you stack it with Luna active. Personally, I think that Anubis deserves some kind of upgrade but he is still strong. 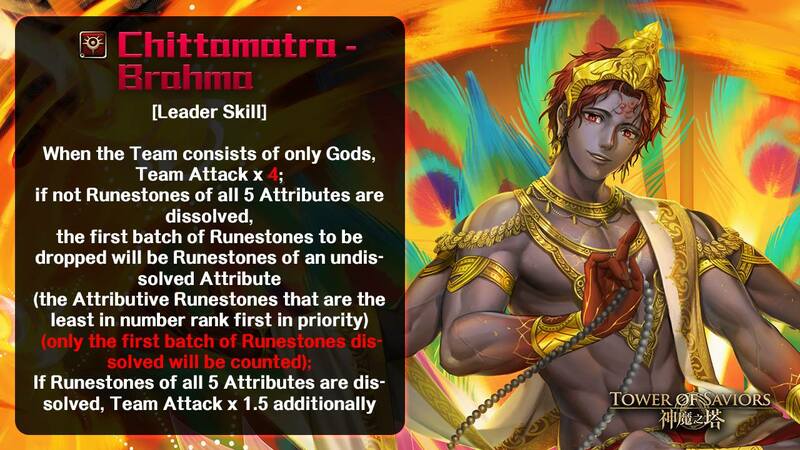 Wealth Pursuer - Kubera: He is perfect for Brahma, even more damage for leader and adjutant and an amazing damage reduction that should last enough to take down most bosses. You can use this guy because 2 rounds of 80% damage reduction is pretty nice and the boosted attack for leader and ally is also really appreciated. His stats are quite high with 3.4k HP. The cooldown is a bit high but I think is fair for all that he offers. I know this thread is missing the sample teams, I will add those a short time later, just be aware that you can combine any of the mentioned cards based on the archetype and combos you are building. Luna spreads Brahma's damage (boosted by either Parvati (x4) or Brahma's own active (x6)). Just my opinion, but non-fire god self-attack boosters aren't a good idea, because you are always going to dissolve more fire runes and fire god runes than any other color. Even if you can control the first drop consistently, you're still losing that extra fire god rune damage. It's better to concentrate attack on a fire god even with a multicolor team. I've used this team for some stages on seal 10. Less so on 10-3: the mono color restriction in the stage and lack of built-in defensive options rule it out for tunestone stages. 0 turn wind up. Have Parvati/Agni in 0 rounds. Good for stages that need burst really quickly. One pro for brahma is that if u face a 5 color shield, brahma only needs to dissolve 4 colors and the last color will fall. Only guy i know that can do that. A big negative for him is no additional spin time which is really not normal for a jackpot card. The only way is add lunas since god restriction. He needs more time and u will feel it. JT's rule of thumb, if ur leader card doesnt have extended time, extra hp or a universal rune then u r in trouble. 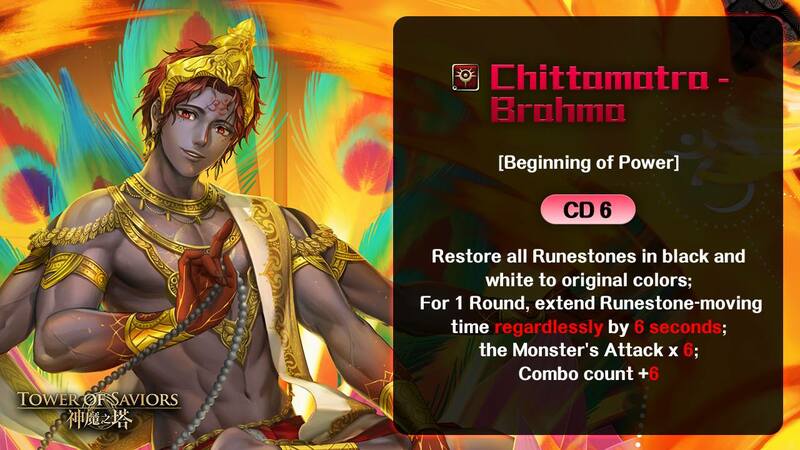 Brahma kinda has a univeral rune but not really.